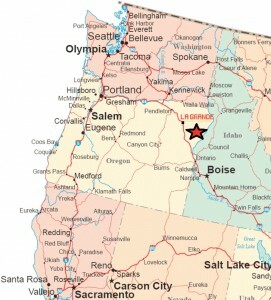 Union County is directly served by Interstate 84 connecting Portland and Salt Lake City and all points north, east, south and west. 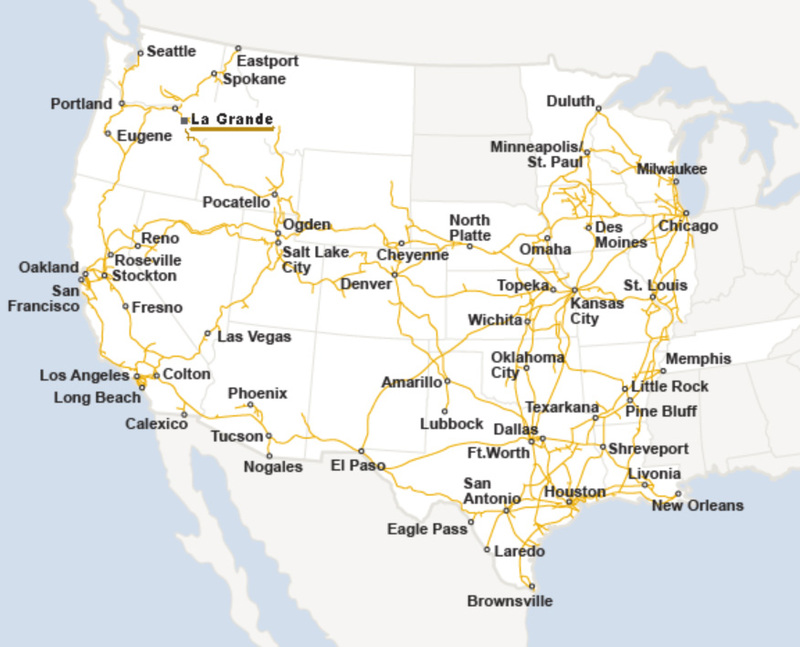 La Grande’s highway connectivity provides fast, efficient and competitively priced shipping connection to suppliers and markets. Within Union County, the communities are connected by highways maintained by the State of Oregon Department of Transportation, providing safe and efficient connection to Interstate 84 for businesses located in any of the communities. Interstate 84 provides businesses in Union County with access to back haul services to most destinations at competitive rates. Union County has rail service with the Union Pacific Railroad. The rail line La Grande links Salt Lake City with Portland, Seattle, and Spokane. Idaho Northern & Pacific Railroad (INPR) leases from Union Pacific Railroad the short line that runs from La Grande to Elgin. 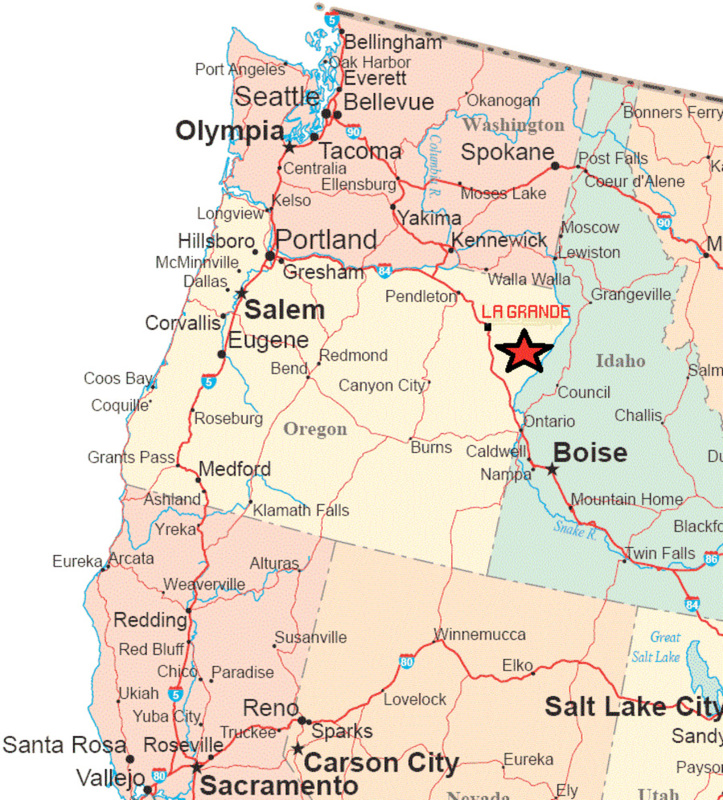 The INPR serves the two Boise Cascade Mills in Elgin, the PGG Alicel grain storage/ shipping facility, the Boise Particle board Plant located 1.5 miles East of Island City and other businesses located on the short line. In 1999 INPR filed to abandon the segment of the short line connecting Elgin with the City of Joseph in Wallowa County. This portion of the line was purchased in 2003 by Wallowa County and Union County and operates on the Wallowa- Union Railroad Authority. The railroad is owned by Wallowa Union Railroad (WURR), a partnership of Wallowa County and Union County. The Railroad operates between Elgin and Joseph. The WURR offers freight service connecting to Union Pacific Railroad in La Grande and operates the Eagle Cap Excursion Train. The WURR contracts with the Sierra Nevada & Pacific Rail to operate and maintain the rail line. The Wallowa Union Railroad’s Multimodal Transportation Hub located in the City of Elgin has been funded in part by a grant from the Oregon Dept. 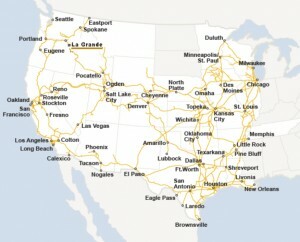 of Transportation’s ConnectOregon program. The project includes right of way and land acquisition of approximately 7 acres in downtown Elgin, a public transit bus garage, bike racks, a park & ride lot, a passenger loading rail siding; and the construction of a Railroad Depot building that provides areas for passenger services, railroad administrative offices and public restrooms. Completion is scheduled for August 2012. Union County has a number of commercial aviation airports within a half-day drive of La Grande. Runway 12/30: 5600ft. x 100ft./1707m. x 30m. Runway 16/34: 3876ft. x 60ft./1181m. x 18m. Additional operational and navigation information can be found here. The Port of Umatilla is located in Umatilla, OR on the Columbia River. The Port is about 95 miles from La Grande, a drive of 1.5 hour on Interstate 84/Interstate 82. The Port can handle container and bulk goods transport by barge to the Port of Portland. The Port is served by Union Pacific Railroad. The Port of Morrow is located in Boardman, OR on the Columbia River. The Port is about 95 miles from the City of La Grande, a drive of 1.5 hour on Interstate 84. The Port can handle container and bulk goods transport by barge to the Port of Portland. The Port is served by Union Pacific Railroad. The Port of Portland is located on the Columbia River and is 270 miles 5.0 hours from La Grande via I84/I5. The Port is home to a number of international maritime shipping companies. Union Pacific Railroad service the Port. NEO Transit provides regularly scheduled bus service in the cities of La Grande and Island City. Service is also provided between La Grande and Baker City with stops in North Powder and Haines.